What. Labor Day was over a week ago? You don't say. I find myself in the strange, RARE position of having taken so many pictures of things we've done lately that I have more post ideas than I can get around to. That is, when I have the energy to blog! So even though we took the boys bowling on Labor Day, I thought I'd go ahead and share the pictures with you ... Instagram-style, since I forgot to take my camera with me. You wouldn't have guessed from the look on Jake's face as we got started that he was super-duper excited to be there. Nor would you have guessed it when he rolled his first ball and stood there with his hands on his hips, waiting as it s-l-o-w-l-y rolled its way down the lane. But trust me: he loved every minute of it. 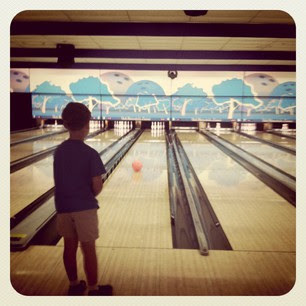 Nathaniel, who has bowled several times, did really well and probably didn't really need the bumpers, but we used them for all the boys anyway. 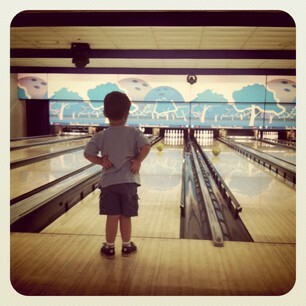 Nicholas bowled several times right down the middle of the lane. 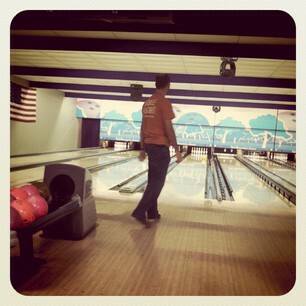 He might not have needed the bumpers, either, but I think it made it more fun for them. 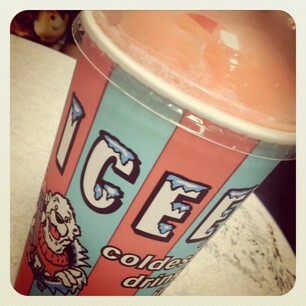 One surefire way to get some grins out of the boys is to treat them to an Icee. 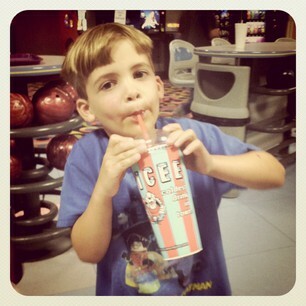 They were pretty sweaty and tired, so the Icees really hit the spot. 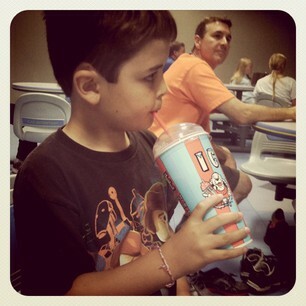 The only blemish on the afternoon was that the NASCAR-like speed with which Nick sucked down his Icee made him sick, so he and I spent the last 30 minutes of our time at the bowling alley running between the fresh air outside and the decidedly LESS fresh air of the restroom. However, within 30 minutes of arriving home, he was as good as new. Thank heavens ... Can't have an end to the afternoon that would preclude bowling again. Such a sweet mama! I really can't handle the upchuck. I become just as sick as they do. Good thing I have my honey to help with that. 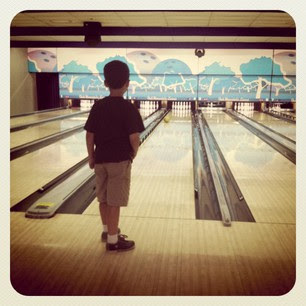 Jake's picture is so sweet. 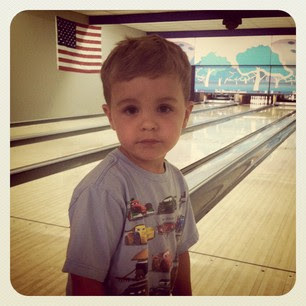 Just think, he's really not a toddler any more, but that sweetness will still be in his cheeks.